Although you might be excited to be exploring your new Android phone, you might not want to talk to everyone who calls you. Several options are available when you don’t want to answer an incoming call. Let the phone ring: Just do something else or pretend that you’re dead. You can silence the ringer by pressing the phone’s Volume key. Dismiss the call: Swipe or tap the Decline icon. Reply with a text message: Choose the text message rejection option, which sends the caller a text message but doesn’t pick up the line. In all cases, when you don’t answer the phone, the call is sent to voicemail. The call log shows a list of recent calls incoming, missed, and rejected. 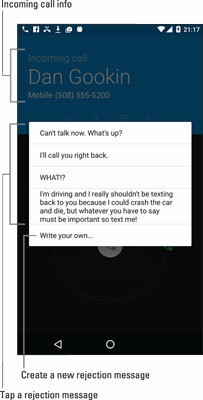 Rather than simply dismiss a call, you can reply to the call with a text message. Choose the Text Message icon or drawer when dismissing a call. Some phones may not display the text message rejection option until after you dismiss the call. After choosing the text message rejection option, select a text message. The figure shows how such a screen may look. After you choose a text message, the incoming call is dismissed. In a few cellular seconds, the person who called receives the message. Not every phone offers the text message rejection feature. The method for adding, removing, or editing the call rejection messages differs from phone to phone. Generally, tap the Action Overflow icon or MORE button while using the Phone app. Choose Settings. Look for a Quick Responses or Call Rejection item.